Clare Bell is an electrical engineer. She builds electric racing cars and also constructed solar, wind, and hydroelectric energy systems for her family’s home in California. Read excerpts of her books at Clare Bell’s website. The Named — (1983-2008) Young adult. Publisher: Ratha and her clan are the Named, a band of intelligent wild cats whose society is based on herding deer. the Named have laws, language, traditions, and leaders. they also have enemies. the predatory raiders of the unNamed are driving them close to the edge of survival. then ratha, a mere yearling, discovers what she calls the “red tongue”—Fire. Her new weapon gives the Named a new defense, but it also rouses the ire of Meoran, the tyrannical clan leader. soon ratha finds herself in exile among the un- Named, but determined to survive. Anyone who has a cat can tell you that they are amazingly intelligent. Imagine if they could talk. 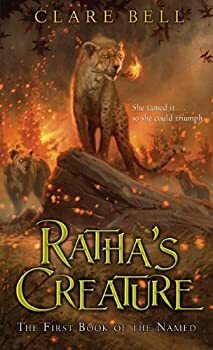 Talking cats are the central conceit of Ratha's Creature, the tale of the female cat Ratha and her fight for respect in the clan of cats that make up her family. Ratha is a challenge to the leadership of her clan, especially the misogynistic Meoran. But when she learns to tame fire, she is a threat that can no longer be tolerated. 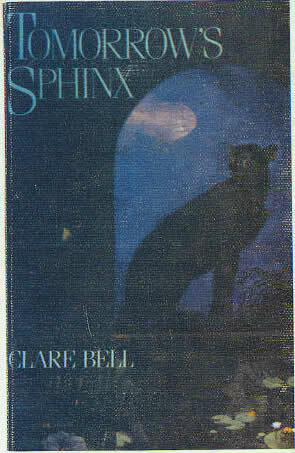 Tomorrow’s Sphinx — (1986) Young adult. Publisher: Two unusual black cheetahs share a mental link, one cat coming from the past to reveal scenes from his life with the young pharaoh Tutankhamen, and one struggling to survive in a future world ravaged by ecological disaster. People of the Sky — (1989) Old technology survives and even thrives on the challenges of a new planet populated by ancient human spirits. Kesbe Temiya, a freelance flyer, accepts a commission to deliver an ancient-but-restored C-47 (a Gooney Bird in 20th Century parlance, named The Gooney Berg by its new owner) to a collector of rare aircraft on the planet Oneway. Dropped off by a starship, Temiya gets side-tracked by bad weather, rescued by a mysterious figure riding an alien flying creature and stranded in a long-vanished Pueblo Indian colony which follows the prophecy of the Blue Star Kachina and lives the old ways, isolated from technology and away from the white man. Despite her own Pueblo blood, Kesbe is an outsider and only by adopting the ways of the People of the Sky, including a ritual that may turn her, too, into a throwback and could even kill her, can she find the help she needs to fulfill her mission-and find the life that is right for her.